Winter Freedom School 2018 was a three day training that consisted of ice breakers, social justice workshops, and community healing activities. It was a way for youth coming from similar and varying identities and communities to meet, exchange ideas, and bond together. In preparation for FS 2018, the facilitation team met for many hours to review, research, and discuss ways to create a more “trauma-informed” courageous space. We wanted to be as intentional in the design of the youth space and incorporate and borrow spaces we’ve enjoyed and have found healing in the past. We filled our walls with freedom fighters that we look to for support and took recommendations from our larger community network. We made colorful signs to create a more welcoming space (including gender neutral bathroom signs), prepared our music playlists, and added art throughout the office space. During our meeting times, we also we identified goals and intentions for this freedom school for those participating in it and ourselves as facilitators. Day 1 consisted of community building, art making, food preparation, and dismantling conventional history by introducing OURstory, HERstory, and THEIRstory. As youth entered the space for the first time, they were asked to read a statement of self-love (a practice we learned by our AFSC colleague Nia Eubanks Dixon). Upon arriving, youth got the opportunity to decorate personal appreciation bags to write personal notes for themselves and others during the entirety of the program. These art activities were followed by ice breakers and food preparation where youth prepared healthy plant-based foods like guacamole and kale salad with lemon sesame dressing. We also enjoyed falafel and chicken sandwiches from a local family owned greek restaurant in DTLA! My favorite activity was creating our personal timelines after lunch. It made me realize that I am proud of who I am and what I have persevered. It left a warm feeling in my heart because I had never before this given myself credit for growing and moving past difficult moments in my life. After this activity, we followed it with “Tea Time” (a practice shared by loba loca) where we learned about a specific plant, drank tea, relaxed, and wrapped up our day. Day 2 was centered on deepening our understanding of race and racism and ways this system of discrimination connects to other forms of oppression. After ice breakers and an art activity, we began this session. We created a collective definition of racism. We discussed ways racism was enforced throughout history through institutions like the Church and science (or pseudoscience). It was a lot to hold, and after introducing the idea of “internalized inferiority” (terminology from People’s Institute for Survival and Beyond) and ways racism has been normalized in our own communities, we used movement to express the many feelings that came with that session. Using movement, dialogue, and food preparation to continue processing and expressing those emotions, we also switched to more hopeful present and vision for future. We each shared a picture of someone or something that inspires us or brings us joy. We then did a silent “street walk” to recognize the freedom fighters on the walls that have and continue to support collective liberation. Learning more about freedom fighters that came before us and recognizing that we too are freedom fighters of today was an important way to recognize my own individual power and the collective power we as group hold. After this activity, we created a “Power Tag” in which youth tagged up the word POWER using ways they see themselves and others fighting back against systemic issues related to race/racism like white supremacy, capitalism, heteronormativity, and misogyny. This was a very powerful activity for me. On Day 3, youth got to visit All Peoples’ Community Center and got to explore the Community Garden and upcoming Community Farm. Unfortunately I was sick and had to head home after the morning, but during our time there, all of us created liberation bracelets to wear and remember whatever feelings, people, and ideas that support us. Youth took part in ice breakers and a experiential activity to recognize our own power and the power of organizing together. With the support of AFSC colleague Crystal, we created a definition of power and identified ways that power plays out in our lives. After that session, youth prepared delicious veggie tostadas with shredded carrots and beets with lemon and salt, black beans, chopped lettuce, hot tomato salsa, guacamole, and queso fresco. I had to head out before eating these tostadas (which I heard were delicious!). Then, youth headed back to the office for final reflection, gratitude circle, created their own tea blends to take home. During this final day of Freedom School, youth also exchanged contacts and signed up to take action and volunteer at the Kermes fundraiser for the new community farm in South Los Angeles! This Winter Freedom School was something I didn’t expect, but it was one of the most beautiful gifts I’ve received so far. Through this facilitation opportunity, I learned so much and got to work with an amazing group of youth. Before this training, I thought I was already a well-rounded community organizer, but as I did some activities with the youth I unraveled a lot about myself. I realized there are many things I had not let go of or healed from, but this space was allowing to do so. There was an activity called to “To All my Peoples” in which one person ends up in the middle of the circle after trying to find a seat in the circle. Each new phase of the game gets a little deeper than the last one, and I remember sharing something that made one youth feel strong enough to also share. Having her share this with me helped me recognize that I am resilient and can heal from past experiences. Our discussions made me recognize how grateful I am for life because I discovered how the simple things have so much beauty within, but sometimes I forget to notice these because of materialistic world we live in. I was eager to join Roots for Peace program as a participant, and as an intern, I know I came in with good foundation of understanding but Freedom School 2018 has continued to make me question more and has motivated me to read and continue to research to be more informed, aware, and continue growing. Roots for Peace’s “3rd Space” is an interactive 2 month program for youth ages 15-18 to explore issues that impact their communities’ health and wellness. Youth that participate will match what they learn in workshops that focus on issues of inequality with practices of gardening, creative writing, art, cooking and trips to other community organizations throughout the city- all to culminate in a community asset project. This program takes place at the Roots for Peace office in downtown LA on Wednesday and Thursday evenings from 4 to 6. In the past month, the youth learned about the history of agriculture in our country (the United States), what is inside processed foods and how it affects our bodies, how food advertising influences what we eat, and the limited food “choices” in black, brown, and low income neighborhoods. To get a better feel about what the students are taking away from this program so far, I interviewed two students. The first student I interviewed 15 year old Andrea Garcia who attends Santee Education Complex. She lives in south LA near USC got involved in this program through her older sister. When she was in middle school she spent three years learning about environmental studies and that really interested her. Her sister knew this and so immediately thought her for 3rd Space. The second student I interviewed was 16 year old, Justin Oceguera who in lives in Boyle Heights and attends Roosevelt High School. Originally Justin thought that this program was a paid job and that is what got Justin interested. Even though its not a paid position, Justin shared that this has been an eye-opening and positive experience that is interesting, fun, and enjoyable. On this day, the students learned about things such as genocide & stealing of native/indigenous lands, Trans-Atlantic Slave Trade, labor exploitation, discrimination, and the rise of the US farm industry. Topics like this are very sensitive and yet so important to be aware of and understand. During the session, the youth learned what is actually in processed foods, the diseases that are caused by the harsh chemicals that are in many common food items, and the diet-related health issues in predominantly black and brown communities. Some of the chemicals that the youth learned about during this session are Sodium Benzoate, Brominated Vegetable Oil (BVO), and Blue, Green, Red, and Yellow. Sodium Benzoate is a common food preservative that prevents the growth of mold and yeasts. It deprives our mitochondria of oxygen and has been linked to hyperactivity in children. Some of the common items it is found in are juices, pickles, pre-made salad dressings, and condiments. BVO is a food additive that keeps citrus flavoring from separating in sodas and sports drinks. It contains bromine which is the element found in flame retardants that has been linked to nerve issues and this is why it is banned in the European Union, Japan, and Australia. Although it is still legal in the US many large franchises such as Fanta, Mountain Dew, and Gatorade have announced that they would remove BVO from their products. The artificial colors blue 1&2, green 3, red 3, and yellow 6 have been linked to thyroid, adrenal, bladder, kidney, and brain cancers. These are found in colorful candy, cereal, chocolate bars, Kraft dinner, juices, and sports drinks. What the messages they are sending in the advertisement are? What information corporations are not sharing in the advertisement? How these messages influence our food choices? Through this neighborhood walk, we were surprised at the amount of coffee and on-the-counter drugs that were being sold around MacArthur Park. Although there was some natural remedy medicines, the majority was not that. Most of the corporate food advertisements were also not supporting healthy eating habits. After the activity, they had the opportunity to connect and reflect on what they saw and how its relatable to their own family stories of health and disease. Lastly, they rewrote the advertisements in a way they thought would accurately describe the product being sold. For example, instead of “2 Monsters for $3,” they changed it to “100 sugar cubes for $3” to represent how much sugar is in just one drink. What recommendations and/or actions do you suggest in hopes of seeing advertisements that speak the truth in the future? In conclusion (for now), Roots For Peace’s 3rd Space program is a space for youth to connect with each other, to learn about peoples’ histories in the United States, and build connections between food justice to other social justices. Youth also critically analyze the various forms of oppressions that make it difficult to be “healthy,” and have opportunity to discover and share culturally-relevant practices that can support the spiritual, emotional, and physical health of youth and all participants in 3rd space. 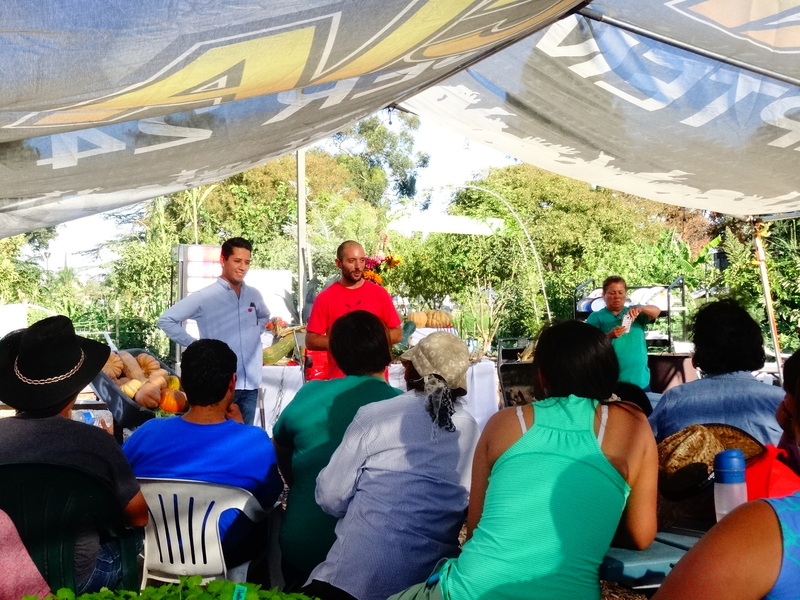 Cultivadores go to Huerta del Valle Community Garden! This weekend, five families made up of mothers, children, and young adults from Mar Vista Gardens visited Huerta del Valle Community Garden in Ontario, California. 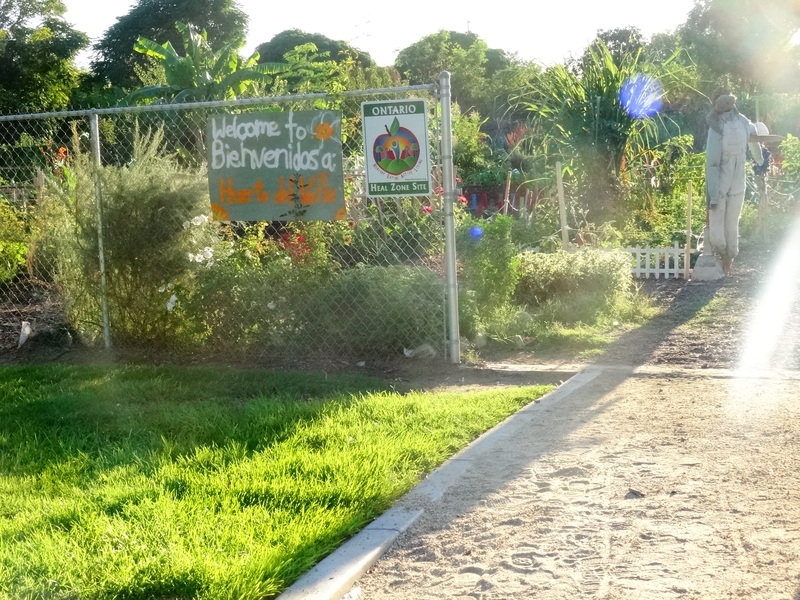 Our trip began in the early afternoon driving away from the Mar Vista Gardens community garden in two vehicles. Upon driving into Ontario after 1.5 hours of Los Angeles traffic, I saw small mom and pop restaurants, liquor stores, one-story homes and trailers nearing the address on our destination. Before stepping out of the car, we all pointed at the fenced area with plants growing beyond the height of the fence. We were confident we had found the garden, and this was confirmed when Maria Alonso, the Garden Manager, came out to greet us as we neared the fenced green area. Styling her green Huerta del Valle shirt, Maria begins the tour by sharing the history of the community garden. 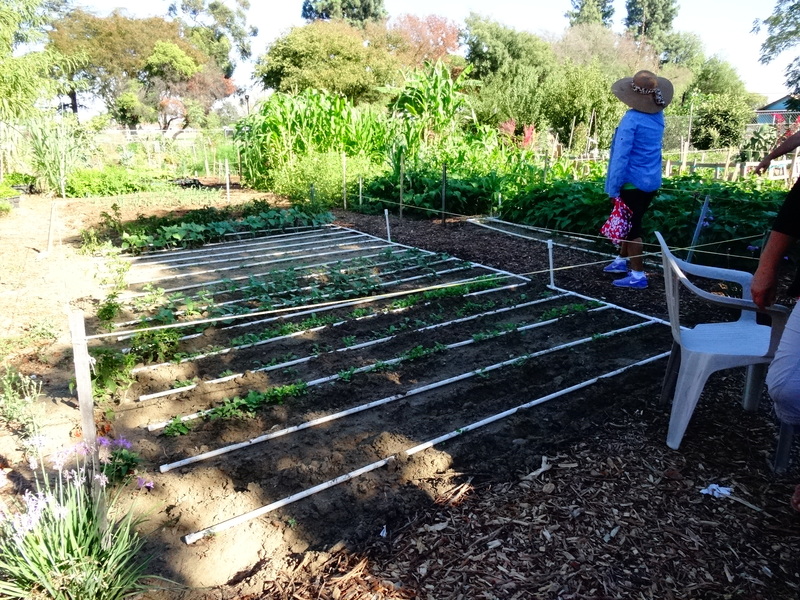 The garden project began in 2013 when she decided to plant seeds in a small plot of land owned by the school district in order to have access to organic food for her family. With time, people passing by and other parents were interested in growing as well and they began to grow food with her. People wanted to produce their food, but they needed more land. 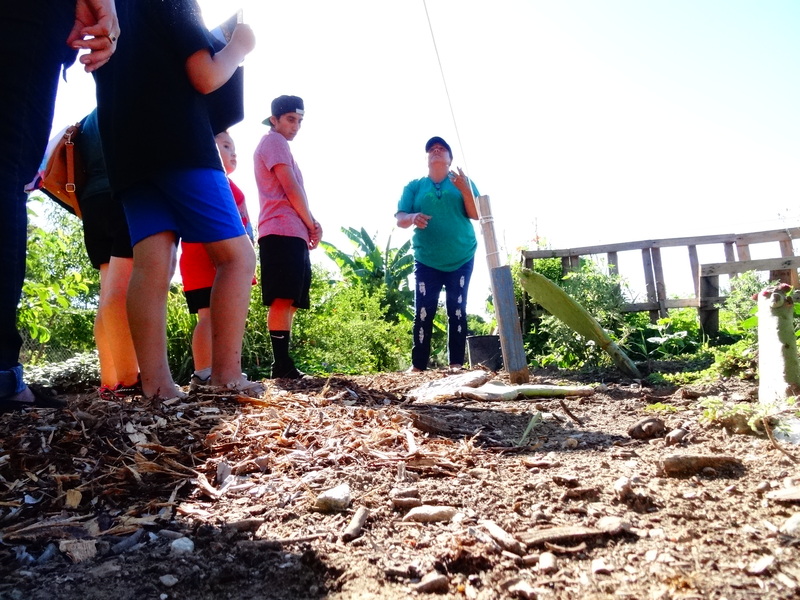 With support from the community and partners like Pitzer College and the City of Ontario, they were able to identify potential land outside the school district to build a community garden. The decision between leasing private or public land came from the city had more interest of an in supporting community health. Maria smiled as she shared this, explaining that support from the city and community partners have made it possible to do what they are doing today on this much larger piece of land. They are reaching their 3rd year anniversary with more than 60 families growing food, a compost facility, and a business that is sustaining the garden by producing organic food for local restaurants and Pitzer College. After that introduction, we continued to tour the garden. 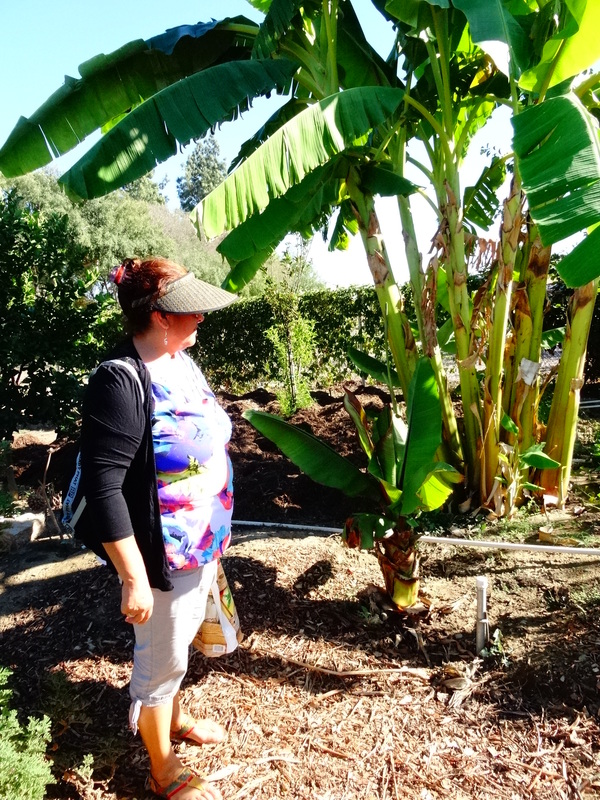 Martha, a community gardener from Mar Vista Gardens, admires the banana plant. Drip irrigation installed in all the plots in order to conserve water. Throughout the garden one will find native plant corners that include nopales, aloe vera, and other succulents. 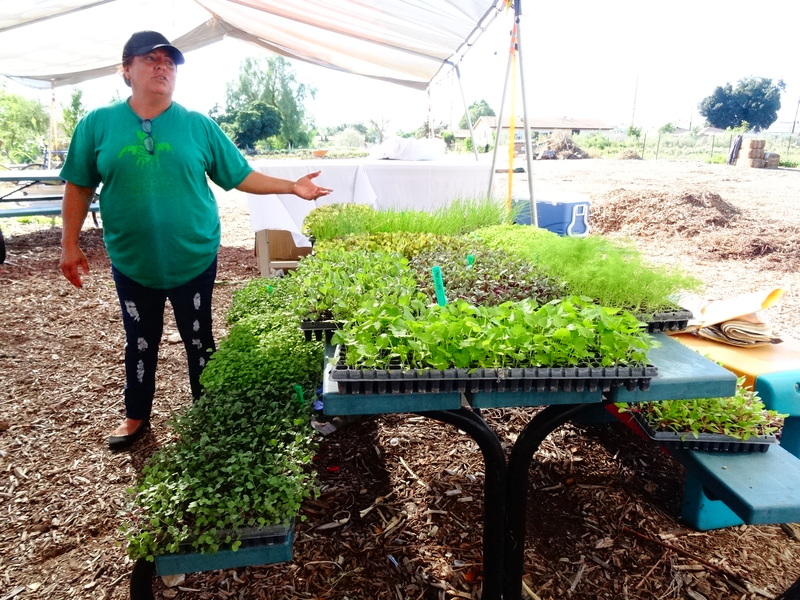 Maria explains how these seedlings were delivered by a university after the community gardeners sent them the seeds to grow them in their greenhouses. 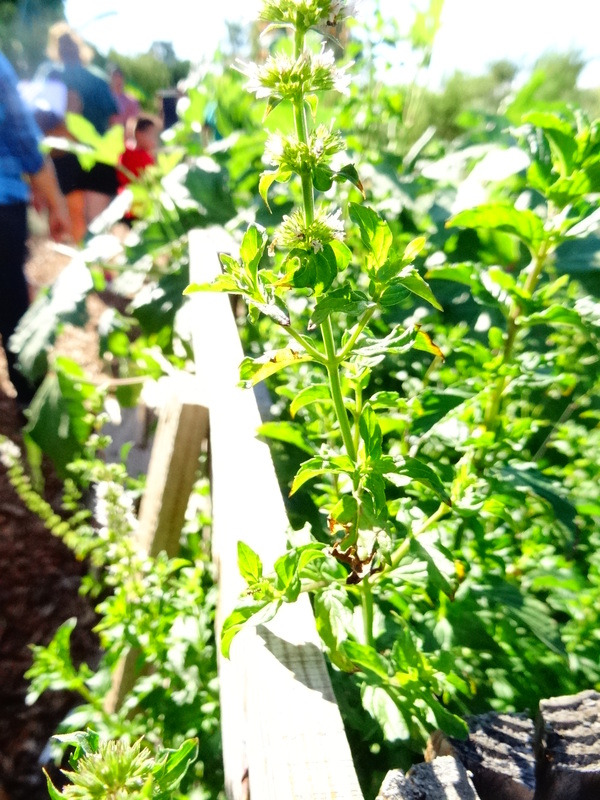 Mint growing next to the wooden fence in one of the community plots. 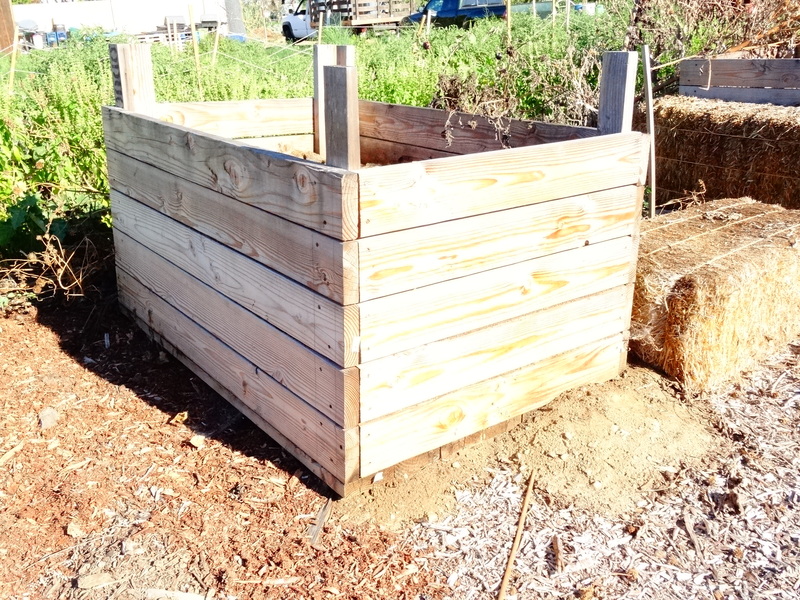 There are more than 8 boxes like these filled with worms decomposing food scraps the community members bring! 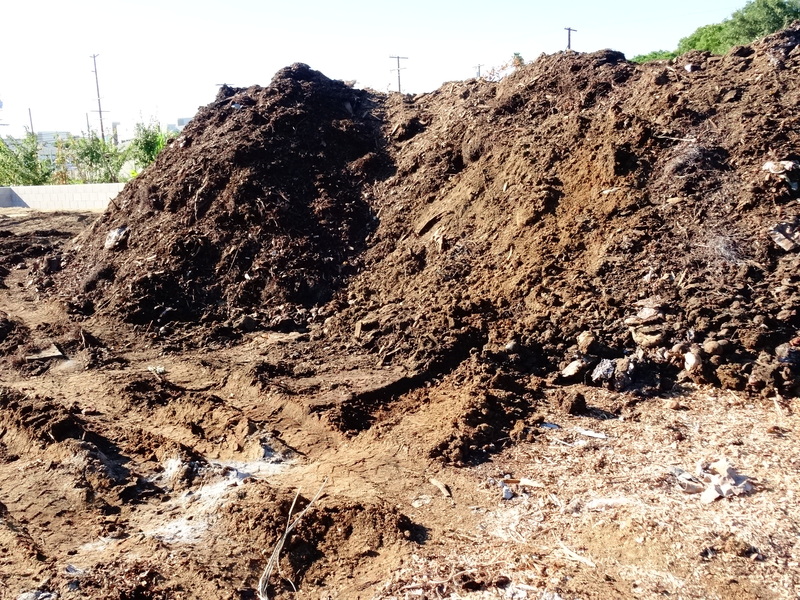 Rich horse manure forms part of their reliable source of compost for the community garden. After the garden tour, we sat down in the shaded education area to welcome Andres Chavez who came to visit the community garden. Chavez started off by sharing how racism and stereotypes many times separate neighborhoods from building power together. This was the case for farm workers in California during the time his grandfather, Cesar Chavez, was organizing. Andres describes the farmworker movement as a multicultural creation, one that was built and supported by farmworkers from Mexico, Central and South America, and of Japanese American descent working in the California fields. Without one of them, it would have been impossible to succeed in their goals. Boycott was the tool of choice for transforming labor practices and increasing agricultural worker rights. By the 5th year on their strike, 1500 striking workers turned into 18,000 and more than 17 million people all over the world stopped purchasing grapes from California. At the same time, Radio Campesino was established to support the voices of those unheard in mainstream media, and more than 5,000 affordable housing units were built for farmworker families. Andres, shares that he admires the work community members are doing. He tells the audience that this work honors his grandfather Cesar Chavez and the many other organizers who gave their life to supporting people in the food system. He ended his speech with his grandfather’s quote, “Es mi creencia más profunda que solamente con dar de nuestra vida encontramos la vida” (It’s my most profound belief that only by giving our lives can we find life). After Andres’ speech, we wrapped up the day by celebrating together with a plate of good food and gratitude for the land, the plants, and our friends who welcomed us into their community garden. 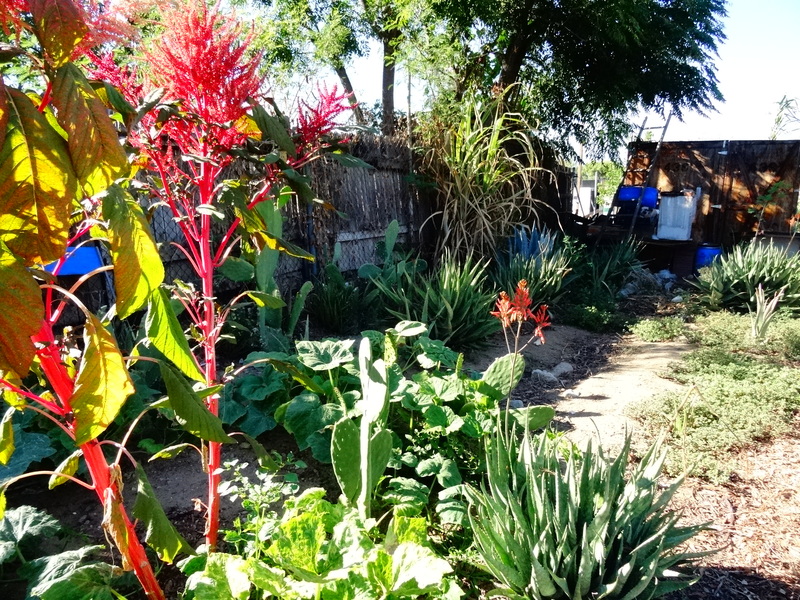 By visiting Huerta del Valle, a garden that is built, worked, and lead by those most affected by the inequities in our food system, we met other cultivadores who are creating positive change for their families and neighborhoods knowing too well that no one else will do this work for them. Like Andres, I too admire the work Cultivadores Unidos and Huerta del Valle members and volunteers do each day. “La Educación del Corazón, César E. Chávez en sus Propias Palabras.” History. United Farm Workers. Copyrighted 1995 Fundación César E. Chávez. Accessed September 22, 2015.